The latest issue of Cheryl Watson’s Tuning Letter is now available on our publications website. This one took a little longer to deliver than originally planned. However there was some late-breaking news on Container Pricing changes that we wanted to include, and then we bumped up against the Thanksgiving holiday and some other large projects that our publisher was in the middle of. The Table of Contents will be available on our public website tomorrow for anyone to view. This issue has articles about Container Pricing (40 pages of must-read information if you are wondering if one or more of the Container Pricing options would be right for you), an important customer experience describing their move from a full speed z13 to a sub-capacity z14, another customer experience about the use of free loaner CPs to determine the value of adding more capacity to an existing CPC, a description of our experiences with the recently-enhanced Knowledge Center, and some valuable user experiences with high MQ CHIN CPU time, the Meltdown ‘remediation’, and some tips on reducing the z/OSMF startup time, especially on a zPDT-based system. Plus there are all the usual news and views and lists of interesting APARs and documents. We hope you will agree with us that it was worth the wait. 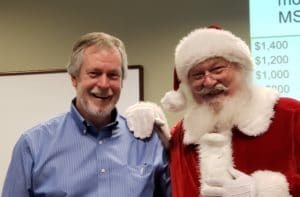 On another topic – regular Tuning Letter readers might remember that three years ago I presented at the SPARTA User Group meeting in Raleigh, and one of the attendees was a gentleman (Duane Reaugh) that looked suspiciously like a certain well known North Pole resident. Well, the SPARTA folks kindly asked me back again this year. I was there last night, and was just about to start my session when what should I hear, but the sound of sleigh bells out in the hall, followed by a personal appearance from the man himself, in his full formal wear. That’s right, Santa Claus was there for my presentation, confirming my theory that Santa is a mainframe user. I guess that when you build 1,000,000,000 toys a year, you need a real computer to run everything for you! That’s all the news for now – I have to get back to the 2018 No. 4 issue because I don’t want a lump of coal for Christmas! As always, please let us know if you have any questions or suggestions, or if you would like to work with us on an article for a future Tuning Letter issue.